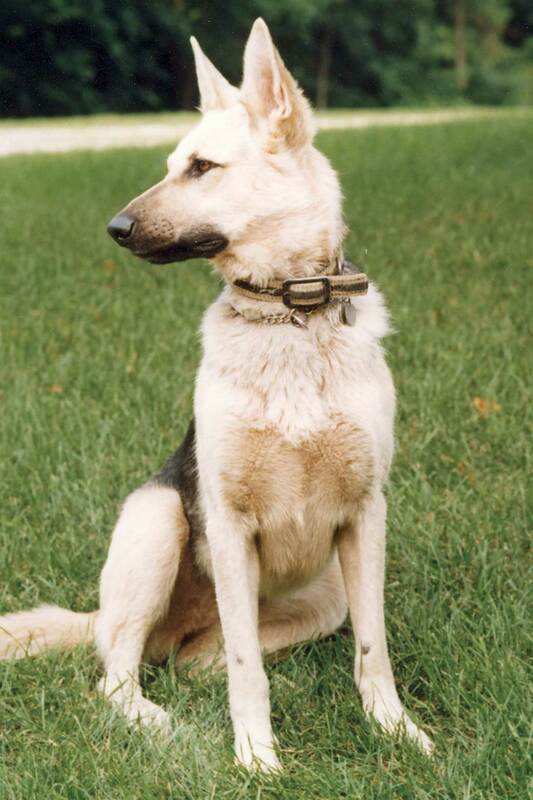 Maidel was a German shepherd who lived with our cousin Irv Miller near Rochester, Minnesota. Maidel and Garrett were "cousins," related by way of the extended family tree of their two-legged companions. Maidel is pictured below. In Irv's words from January 2012, "Maidel was the first dog that I paid for: $75 from a farmer near the neighboring town of Hayfield. Maidel’s mother was from Israel. The farmer’s daughter had been to Israel and married a fellow that owned Maidel’s mother. When they came to the US, they came with the dog. I never found out if Maidel’s mother was a Jewish dog or a Palestinian." More about Maidel below the pictures. Irv now has a German shepherd named Samson living with him. "Maidel was about six weeks old when we purchased her. he was the last remaining dog of the litter, so we did not have a chance to select her from her siblings. 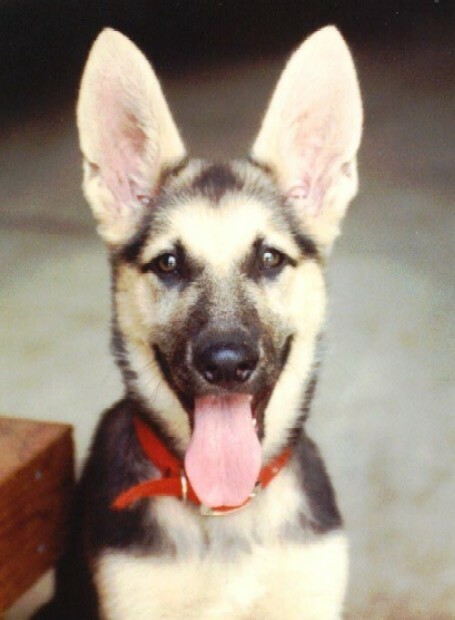 Her ears were as tall as the rest of her and stood straight up, which is unusual for a very young German Shepherd. As a young pup, she was marked like a full-grown black and tan. Most German Shepherds at that age have a lot of black that retreats as they age. Maidel’s black also retreated, changing her from a very cutely marked puppy to a very bland, mostly tan dog. "Maidel was my first and only therapy dog. When she was about 12 weeks old, I took her to Sioux City, Iowa to visit my Sister and my mother. My mother was in a rest home there. The recreational director of the rest home asked me to bring my puppy into the home, which I didn’t think would work out very well. Anyway, I did, and the residents were just thrilled to see the little puppy with the huge ears. There was a nun in a wheelchair who, I am told, had not spoken in years. When Maidel approached her, she opened up her arms and hugged Maidel and started talking to her. Later, Maidel went over to visit another woman sitting in the solarium. The two of them got into a tussle over who was to have possession of the woman’s slipper. That was the end of Maidel’s career as a therapy dog. "Maidel loved to retrieve and would drop the retrieved object at your feet and beg you to throw it again. She would not stop looking for it until she found it. When Brian and Sandy Golob’s twins were about 5 years old, and were visiting us with their family, they discovered Maidel’s passion for fetching. It was about 100 degrees and very humid that day, and the twins almost killed Maidel by sending her into Gelk’s Gulch after her ball all afternoon. "I have a friend, Myron, who lives about seven miles from me. To get to Myron’s, I have to cross a river and take four different paved and gravel roads. Myron has a tree farm, a saw mill, and a dog. When Maidel was about five years old, I took some logs that I had felled from my acreage over to Myron’s to be milled into lumber for my woodworking projects. Maidel came with me. Before we started up the mill, Myron encouraged me to let Maidel out of my vehicle to run and play with his dog, which I did. About four hours later, we were finished sawing my logs and I looked for Maidel. Myron’s dog was lying there watching us, but no Maidel. I called, I walked the tree farm, I knocked on the doors of all of Myron’s neighbors, but no Maidel. I left my jacket near Myron’s house, just in case Maidel returned, so she could smell something familiar and stick around. I then drove the seven miles home with my load of lumber and watery eyes, thinking I would never see Maidel again. I turned onto my private road from the township road and drove up my 500-foot private roadway to see Maidel standing at the end of the roadway looking at me as if I had been lost. It was like out of a story book. "In the latter part of her eighth year, Maidel developed what was suspected to be hemangiosarcoma. She had an enlarged spleen which was removed. She seemed to be recovering very well from the surgery when I took her home the next day. However, during that night, she went into shock and died before I could get her to a vet. Maidel is buried next to Pepper on my property." 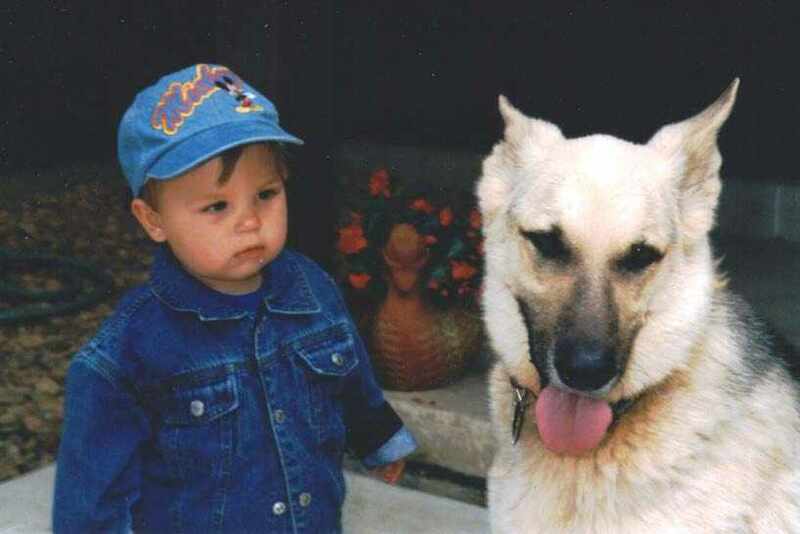 Irv's next German shepherd was named Shayna (2000-2008).